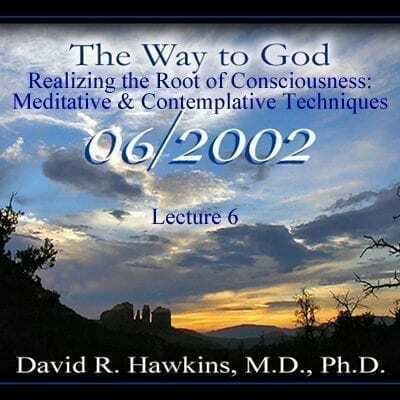 In this essential lecture, “Realizing the Root of Consciousness: Meditative and Contemplative Techniques”, Dr. Hawkins discusses the time-honored tradition of the practice of meditation, which he informs us is actually our natural state. Instead of covering the numerous styles of meditation, he delves into the essence of the meditation process itself. He talks about how we can obtain the benefits of meditation without going through formal renunciation, where in the ordinary world this would not be possible. Dr. Hawkins explains two valuable ways of meditating which he experienced himself. He also tells us of the various ways to transcend the mind to become aware of the presence of God.